“The ‘Israelis’ have been hard at work attempting to cut off weaponry roads and prevent us from coming into possession of precision missiles. But all their efforts were a waste of time. I say to the Zionist entity, that scheme you had?! It’s all over! We are now in possession of precision missiles so if ‘Israel’ dares impose a war on Lebanon, it will face the most unimaginable fate, one it would never expect! The Israeli enemy knows intimately that technology alone doesn’t constitute the final word in any given battle without human capabilities. And when it comes to the latter category, we in Hizbullah are very well-armed.” Pure flames; pure power; pure Mouqawamah. “Wallahi! Go ahead and kill me once. Then resurrect me. Kill me again and resurrect once more. Then kill me yet again and scatter my remains to the winds. Repeat this process a thousand times. I will go through this and so much more just so you and your pure family may survive! No matter what, I will not ever leave you, ya Imam Hussein (A.S.)!” Subhan’ALLAH. Masha’ALLAH. ALLAH yehmi. From now until we’re resurrected on Youm al-Qiyamah, let it be known that Ashoura isn’t complete without Sayyed Abou Hadi and the magnificent heroes he commands. Labaykah ya Hussein (A.S.)! 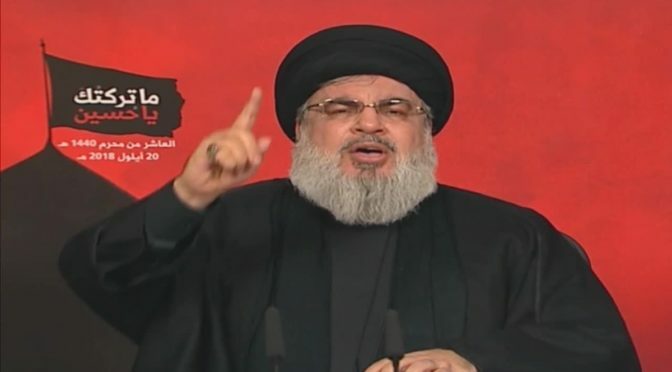 Labaykah ya Nasrallah! Death to the usurping Zionist entity! And in the name of Ashoura… Victory to the Husseini Axis of Resistance!